Britain’s Attorney General for the Six Counties has directed that a fresh inquest be carried out into the killing of an unarmed Tyrone man who was shot in the back by the British Army in August 1974. 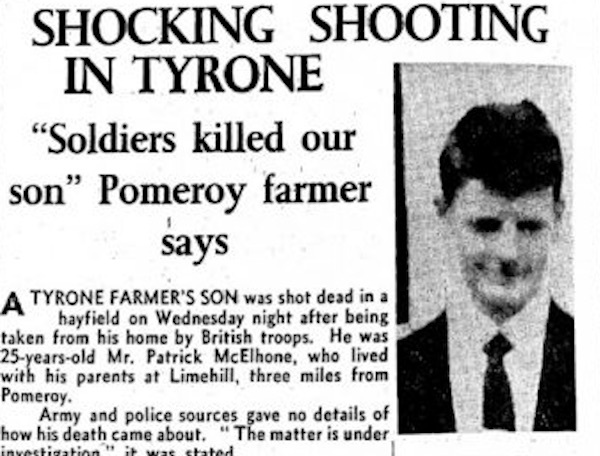 Paddy [Patrick] McElhone, aged in his 20s and who had a severe learning disability, was taken from his home and shot dead by a British soldier in a field near to Limehill Road. In March 1975 a lance corporal from the Royal Regiment of Wales was charged with the murder but was found not guilty in a non-jury court. In a disturbing judgement, the judge said he was satisfied that the soldier, Roy Alun Jones, reasonably believed that he might be dealing with a paramilitary seeking to escape and that his action was reasonable under the circumstances. The McElhone family received a payment of 3,000 pounds. Mr McElhone’s mother died a month after the money was paid and his father a short time afterwards. In a letter to the Dublin government at the time, two local priests, Fathers Michael McGirr and Denis Faul described the killing. They said Paddy was a quiet young man whose only interest was playing an accordion in a local band. “In recent weeks a new regiment has been very active and provocative in the Pomeroy area,” they said. “Sinister movements like spying on certain houses and harassment of the people have created a climate of foreboding and fear. “On Wednesday searches were made in the Limehill district. The soldiers went to a number of small firms and harassed the people with their foul language and threatening behaviour. “They spoke to the deceased, Paddy McElhone as he was cutting hay in a field. “Later that evening at six o’clock as McElhone waited at home for his tea two soldiers called at the door, saying: ‘Come out here... We want a word with you.’ The young man went out and the soldiers closed the door on his father and mother. “The mother had a view of the road and she saw a number of soldiers gathered around Paddy. She heard one of them say: ‘You’re not doing much to help the army’. “She then saw soldiers shaking him severely. They then took him further down the road. Mrs McElhone asked her husband, Peter to go out and see what was happening to Paddy. In the hours after the killing, Jones first claimed the shooting had been an accident, but in a prepared statement to police in Cookstown, he changed his previous account saying that Paddy had run away and had failed to stop at his command. Jones died in 2002. The letter said a second British soldier, a Private Bedford who was at the scene of the killing, should have been called to the trial and to Paddy’s inquest. He also stated that he was treated “appallingly afterwards by some of the soldiers in the regiment and told to “keep my mouth shut and go with the flow”. However that evidence was not heard at the murder trial or the inquest.